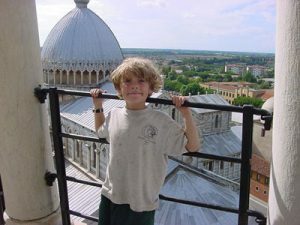 Visiting Italy with kids is a blast, because many Italians are very friendly to other people’s children and everyone will always be talking to your kids, helping you out, making them laugh, and generally helping you have a good time. Don’t be too suspicious – relax and enjoy the attention! Start out in Florence with the Duomo (the cathedral) and the baptistery across the street from it. There’s a big piazza (square) where the kids can run around. Don’t miss Michelangelo’s David in the Uffizi Museum across town, either. The next day, get to Pisa early to get tickets to go up the Leaning Tower (there’s often a wait of several hours between when you get the tickets and your admission time). Be warned – nobody under 8 goes up the tower. While you’re waiting, check out Pisa’s Duomo and baptistery – notice the upside-down Roman inscriptions re-used in building the baptistry! There’s plenty of grass for the kids to run around on around the base of the tower. If your tour is more extended, check out our pages on Genoa and Venice as well. And Rome deserves its own section! Cite this page: Carr, K.E. Visit Italy with kids! Sights to see. Quatr.us Study Guides, September 3, 2017. Web. April 23, 2019.